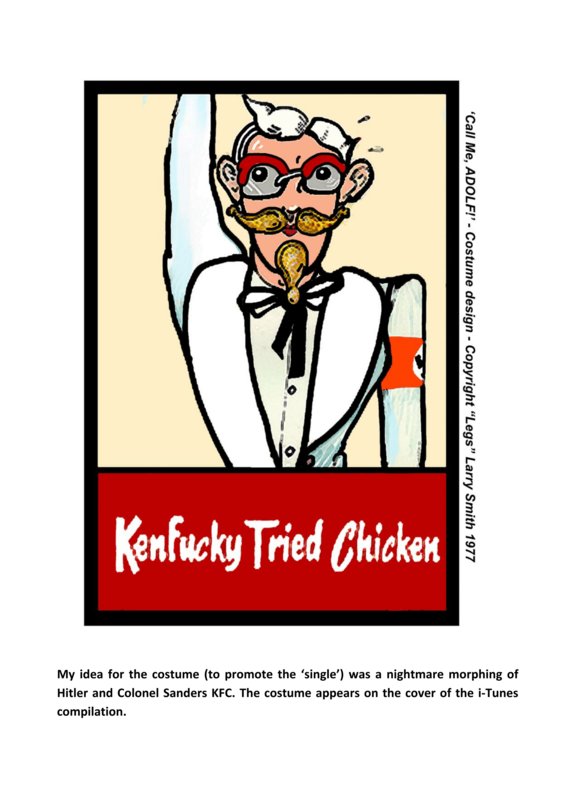 Gus had wanted to do a cover of "Springtime for Hitler" for some time as he was a great fan of the Mel Brooks film. Gus & Phil sat down and discussed who to approach for the project, and they both came up with the idea of asking Legs Larry Smith of The Bonzo Dog Band. Gus had already been involved in the production of two Bonzo albums, "A Doughnut in Granny's Greenhouse" and "Tadpoles" and knew the members of the band well. click for more When Legs Larry was approached he confirmed that he too had been thinking of the same project, and so he readily accepted and went on to develop three more tracks based on what could be expected in the stage musical within the film; "Der Fuehrerburger", Eva Braun New Girl", and "Mountain Boy". This musical he named "Call Me ADOLF!" and will hopefully be staged one day. A considerable amount of marketing was spent on these tracks before they were cancelled, and included an unconfirmed rumour of a pink tank being driven down Oxford Street to publicise the project. Legs Larry was rehearsing these tracks nearby at Bray Studios with Adam Francis when Ted Fletcher, the designer of Adam's "Alice" mixing console phoned and asked if he could show some customers around. Ted duly arrived with these customers who all happened to be German, and not knowing what Legs Larry was working on asked if they could play a multitrack back. The tape on the machine was Springtime and was played back to the surprised Germans who eventually saw the funny side of it. Legs Larry did not help by adopting a fake German accent throughout it all. Mel Brooks himself is quoted as saying "It's been one of my lifelong jobs - to make the world laugh at Adolf Hitler". 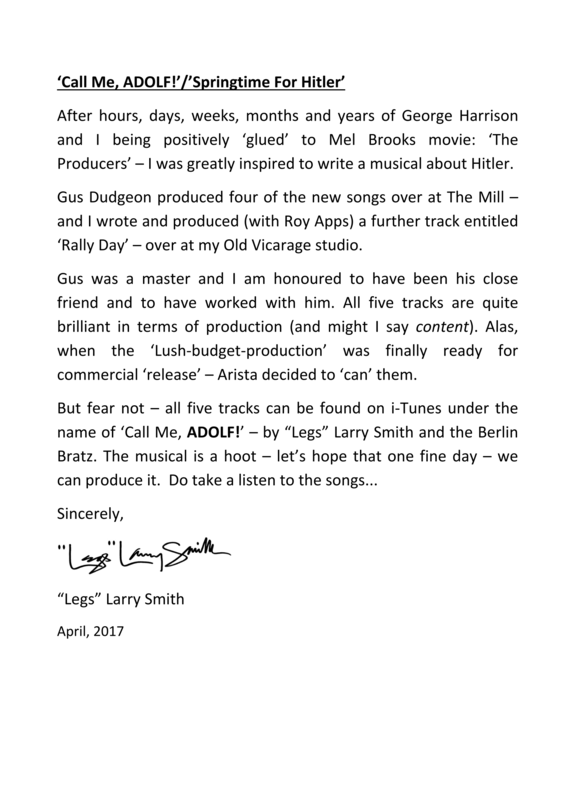 Many thanks to Legs Larry Smith for sending the two attached documents - a letter describing the history of the tracks, and an image of his original artwork for the single. Click on either of the images to see larger readable versions. The four lower tracks were all recorded at The Mill, produced by Gus Dudgeon and engineered by Phil Dunne. The first track is a copy of the original film version, used to transcribe for the cover version.